Last night sparkled. 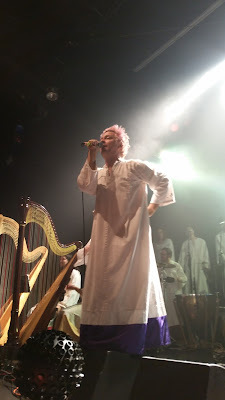 The Polyphonic Spree , played at the El Rey in Los Angeles, as part of their 15th Anniversary Tour. 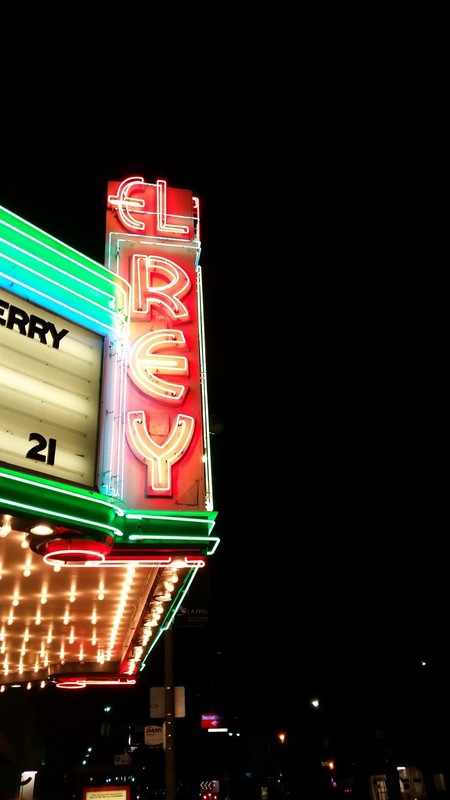 For those of you who are familiar with the El Rey Theatre, you know that it's a small venue. This excited me, as I knew this would create a sort of intimacy. 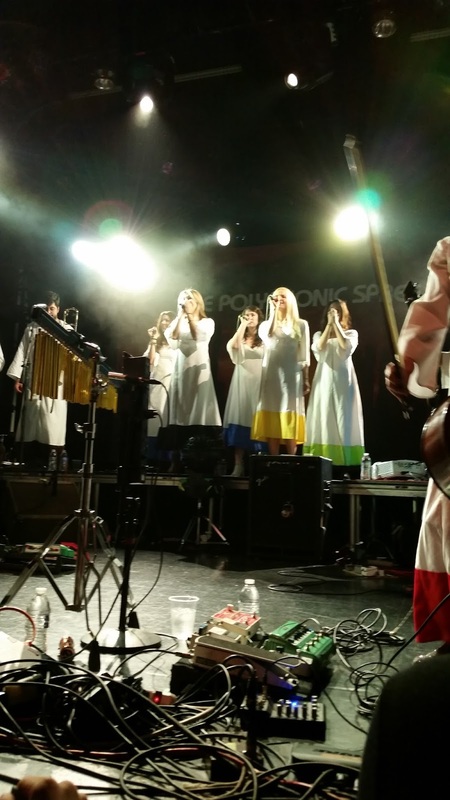 My first experience with The Polyphonic Spree took place at The Derby (R.I.P) in Hollywood. 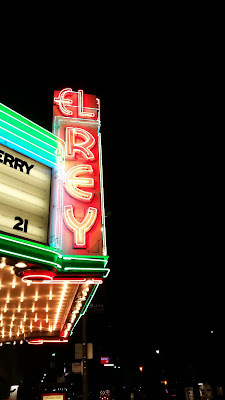 The Derby was a landmark venue, and one of the several spots where I would swing dance. The Derby was a tight squeeze, so watching this 20 piece band in such close quarters was intense. After their first song, all was quiet. It was a...somebody say something kind of tension. While we stood stunned, one of my fellow attendees said; "DID THAT JUST HAPPEN? !" The rest of us laughed, grateful for balloon -like release. Since that night in 2002, The Polyphonic Spree has remained one of my favorite bands. The Spree dressed in their most basic and recognizable garb, which they first fashioned at the time of their debut 15 years ago. After the band played their first album, The Beginning Stages of..., there was a quick wardrobe change, and then and then a second set that included their current fine tuned psychedelic pop. 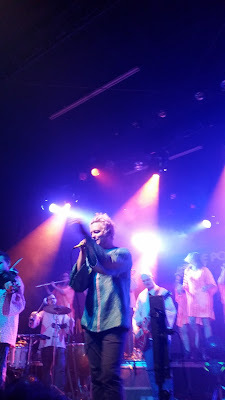 As the music whirled around me, as I look up at front man Tim Delaughter, and see a whimsical close-eyed smile, and a swaying- sailing frame, towered over me. It’s been so long since I've sren a person enjoy music that much. He even shushed the audience when a few strays got to be too gabby. As I watched this man swell, I found myself remembering the 2002 Tim, who looked like the Messiah, with his mid-length curly chestnut tresses and extatic calm. Yeah; that's what I'll call it. Prior to that show I read an article in the LA Weekly that offered a brief description of the band, and a clarification from the band. 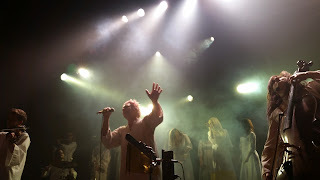 This may be a mis-quote, but I recall, "We are not a cult." I'm never one to shout out song requests, or bouts of praise, but in my head I said, "Happy 15", and out loud, at the end of the night, I called out, "Thank you."